Earlier in the day it had been a first round exit in the Mixed Doubles event when partnering Chen Szu-Yu; later a Men’s Doubles quarter-final exit in harness with Chen Chien-An. However, for 37 year old Chuang Chih-Yuan at the Seamaster 2018 ITTF World Tour Lion Japan Open in Kitakyushu on the evening of Friday 8th June, it was success and success contrary to expectations. The no.9 seed, in the second round of the Men’s Singles event he beat Simon Gauzy, the no.7 seed, emerging successful in six games (11-4, 9-11, 7-11, 11-6, 11-5, 11-6). 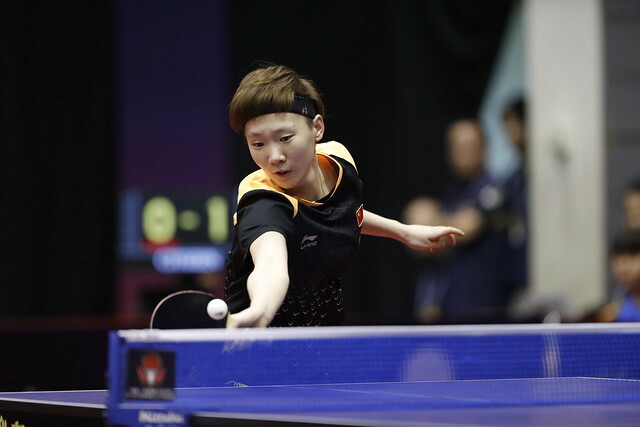 Success for Chuang Chih-Yuan in what was a reversal of fortunes on the ITTF World Tour in Japan; in 2016, having beaten Simon Gauzy in Budapest, in Tokyo, he experienced defeat. An upset according to ranking, in the remaining three second round matches completed on the evening of the first day of play, it was success as per status. There were wins for Germany’s Timo Boll alongside the Japanese duo of Kenta Matsudaira and Jin Ueda. Timo Boll, the top seed, repeated the success he had enjoyed at the recent Liebherr World Team Championships in Halmstad by beating Sweden’s Mattias Karlsson, the no.12 seed (11-7, 11-6, 11-8, 11-5); likewise it was a repeat performance from Kenta Matsudaira. On the ITTF World Tour in 2016, Kenta Matsudaira had beaten Benedikt Duda, like Timo Boll from Germany, in both Austria and Sweden. In Kitakyushu, he repeated the performance; the no.8 seed, he emerged successful in five games (11-8, 7-11, 11-9, 14-12, 11-6). The end of the road for Benedikt Duda who had been required to compete in the two day qualification tournament; it was the same for Kazuhiro Yoshimura; he was beaten by Jin Ueda, the no.13 seed (8-11, 11-9, 7-11, 11-8, 5-11, 11-6, 11-6). Play in remaining second round Men’s Singles matches plus the quarter-finals will be played on Saturday 9th June.